On the 14th of April 2004, South Africa held its third democratic election. An election is an indicator of the extent to which citizens truly participate in public decision making. One vehicle for empowering citizens to participate in an election (especially in rural areas) is community radio. 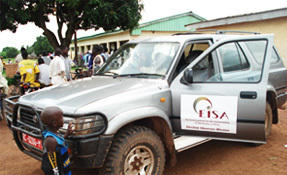 In an effort to enhance citizen participation during the 2004 election, EISA worked closely with community radio stations to capacitate them and ensure that they were able to put in place relevant, election-related programmes that better equipped citizens to make an informed choice when casting their votes. The conference's primary objective is to evaluate the impact of the programme. It will also explore the challenges that community radio faces. With the local government election on our doorstep, it is important to enter into this analysis to ensure that when the time comes, community radio stations are well prepared and equipped to provide citizens with programmes which are relevant to the strengthening and consolidation of democracy in South Africa.